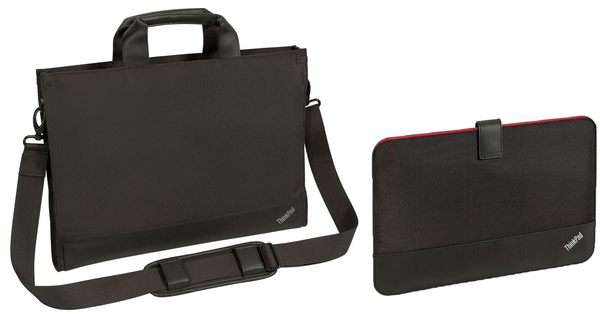 Carry your ThinkPad Ultrabook in style in the newest slim and fashionable Lenovo brown topload and sleeve set. These lightweight cases provide comfortable use while easily transporting and protecting your laptop as you travel to work, school or around town. Modern style with distinct ThinkPad features, with signature logo and zipper pull Includes a sleeve with red-interior lining for use with topload case or by itself. Adjustable and detachable shoulder strap with removable padded patch for improved comfort. Padded laptop compartment for added protection. Main compartment with workstation for accessories. Fabricated with durable and high quality materials: Material: 1680D polyester / 70D polyester, Inside lining : 150D polyester, Soft polyurethane (PU) trim handle.